Following their second sold out show at Carnegie Hall last month, TENGGER CAVALRY have brought their nomadic folk tradition to brand new level. 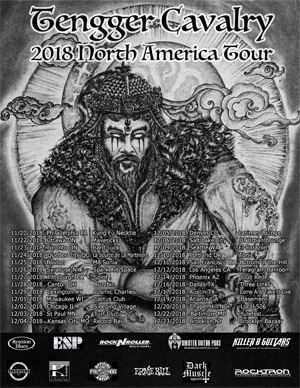 The band has announced their fourth North America headlining tour, which will see them showcasing two sets every night with both traditional Mongolian folk music, inspired by the success of Carnegie Hall gig, and their brutal heavy nomadic metal songs. The tour starts November 20th in Philadelphia, PA and runs through December 23rd in Brooklyn, NY. A complete list of dates can be found below. In conjunction with the announcement of the tour TENGGER CAVALRY have released a brand new lyric video for the song "Our Ancestors", taken from their latest Napalm Records' Release Cian Bi. Watch the lyric video below.